David E. Gillham ended the regular season with a win during the Toyota Bassmaster Weekend Series, operated by American Bass Anglers, East Texas Division 11 tournament, held May 18, 2013, on Cedar Creek Reservoir. Running out of Log Cabin Landing in Malakoff to fish the 32,623-acre lake on a warm, blustery day, the 49-year-old angler from Heath caught five bass weighing 16.14 pounds. For the Boater Division victory, Gillham took home a check for $2,502. In second for the boaters, Ricky E. Phillips, 51, of Trinidad, Texas, landed a five-bass tournament limit going 15.96 pounds. He anchored his bag with a 6.52-pounder that won the division big bass race. He earned $1,251 for second place and a $270 bonus for the big bass. Scott A. Dean of Terrell took third place among the boaters. He caught five bass to finish with 15.44 pounds. For the effort, he pocketed $834. In fourth place for the boaters, Trent Menees of Saginaw, Texas, landed five bass for 15.17 pounds with a 4.90-pound kicker. Drew Sloan of Scurry wrapped up the top five boaters with a five-bass limit for 14.73 pounds including a 4.96-pound kicker. 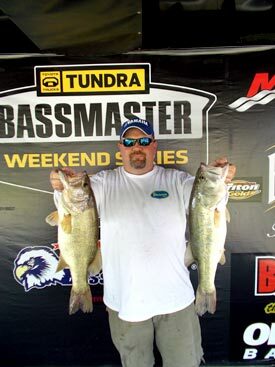 In the Co-Angler Division, Bobby S. Boyd, a 45-year-old angler from Kemp, won with three bass going 11.33 pounds. For the effort, he collected $1,234. Taking second for the co-anglers, Dillon J. Pechal of Ennis brought in a three-bass division limit for 9.21 pounds. Virgil W. Akin of Rhome found three keepers for 9.10 pounds. Randy Sprouse of Holly Lake Ranch landed three bass for 8.69 pounds. Patti Campbell of Waxahachie caught three keepers and finished fifth for the boaters with 8.41 pounds. Martin M. Montfort of Corsicana only caught one bass, but made it count. The 7.57-pounder won the tournament big bass title. The two-day divisional championship will be held July 20-21 out of Johnson Creek Park near Jefferson, Texas, to fish the Lake of the Pines. For more information on this tournament, call Porter Trimble, tournament manager, at 318-201-3474 or ABA at 256-232-0406. On line, see www.americanbassanglers.com.